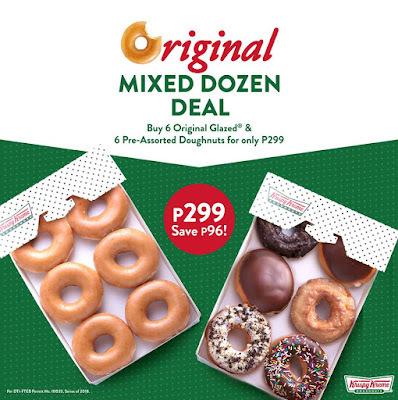 Check out Krispy Kreme's Original Mixed Dozen Deal! Buy 6 Original Glazed ® and 6 Pre-Assorted Doughnuts for only P299 from June 15-17 and June 29-30 only! • This promo is valid in all Krispy Kreme stores EXCEPT for MOA Arena, Makati Med and Airport Stores. • Valid for dine in, take out and drive thru only. • Promo is limited to 2 sets per transaction only. • Promo cannot be in conjunction with any other promos or discount. • In the purchase of good and services which are on promotional discount, the senior citizen can avail of the promotional discount or the discount provided under the Expanded Senior Citizens Act of 2010, whichever is higher.